Here I am working on the boat last night. I had a 2-hour evening Board call and thanks to Rand’s ingenuity, I was able to participate on the call from the most beautiful and comfortable setting imaginable. Rand set up this hammock between the mast and the genoa so I joined my Board call while anchored in Ford Pond Bay, off Montauk, NY. There was a half-moon in the sky casting a wide moonlit path across the water, and a million stars overhead. Heavenly! The hammock was very comfortable, and even more so because Rand tucked me in with blankets to stay cozy from the winds that were blowing over 20 knots yesterday evening (with gusts above 30 knots). 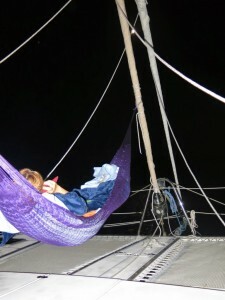 The hammock felt like a cradle, with the winds making the hammock swing from side to side. During much of the call, I was in listening mode, not talking, so I muted my phone. When I had to chime in, before I took the phone off mute, I would pull the blue blanket over my head. This kept the wind from swooshing past the microphone, which would have interfered with the call. hahahahaha, I am so glad you have figured out how to do all of this. I’ve been giving interviews from my boat for years and I always love knowing they are picturing me in an appropriate ‘work space’, well, I’m thinking a play space is the best work space ever because it stimulates our creative right minds. Go Ellen Go!